Several years ago, back when I still used Groupon, I found out about a company called “Wine Insiders.” This company offers cases of limited selections of wine at bargain prices–often under $10 a bottle. Thomas and I have ordered from them several times and have never been disappointed by the wines–they aren’t stellar but they are all very good and easy to drink. 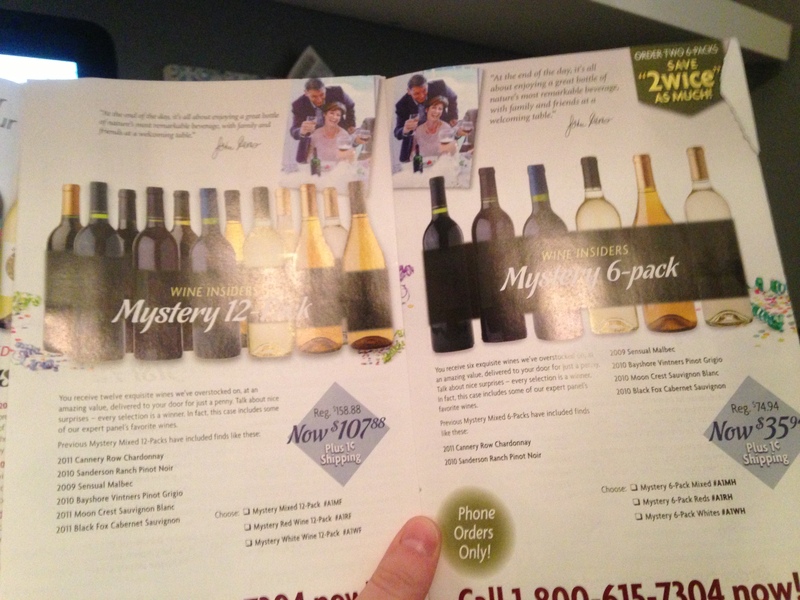 Our favorite thing to order from them is the “mystery pack” of 6 reds and 6 whites often for only $75 dollars. So, understandably, we are excited every time a flyer from them arrives in the mail. Somehow, we got on their list multiple times with multiple variations of our names (his name + my last name is my favorite) and so we usually get several flyers at once. 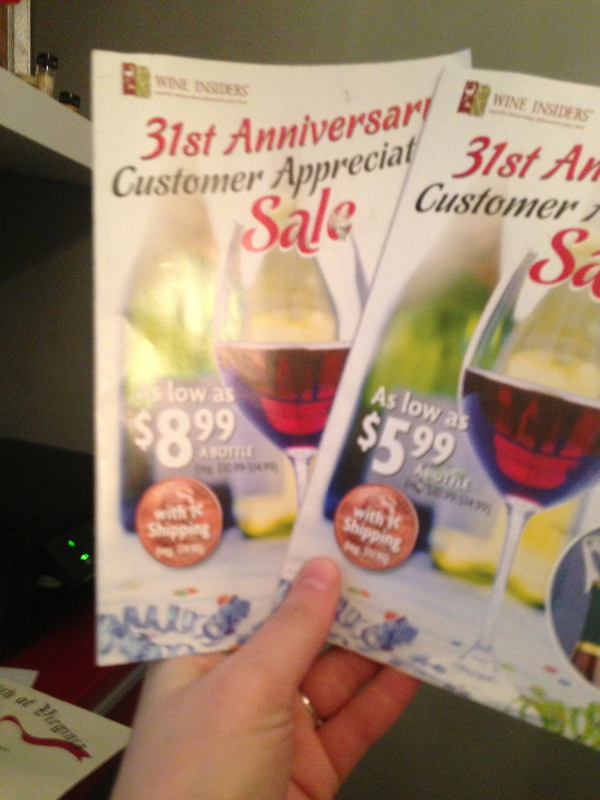 Last night, we received 2 flyers for their “customer appreciation sale” and I opened one and exclaimed “the mystery pack is only 35!” A few minutes later, Thomas, while looking at his flyer says “wait, I don’t see that…” Then we discovered the scam! Bottles as low as $8.99! Or is it $5.99? Granted the more expensive price is for 12 bottles, but do the math and you’re still paying $18 more per every 6 bottles. I have no idea why they are doing this and it just feels wrong! This is the exact same wine they are selling and since both flyers were addressed to Thomas, it certainly wasn’t an issue of one of us being a customer longer than the other. I guess Thomas B. is considered more of an insider than Thomas H.
I still intend to order from them this time. But in the future I may not unless I get multiple flyers to comparison shop. And even then, how do I know I’m getting a fair price? I would love to know what Wine Insiders has to say about this unfair practice and I intend to ask. Customer Appreciation? I think not.